We’ll be “On the Same Page” all summer! Summer officially starts Wednesday — what’s that mean to you?? On the Same Page is a blogging book club that will be hosted by five amazing professional coaches. 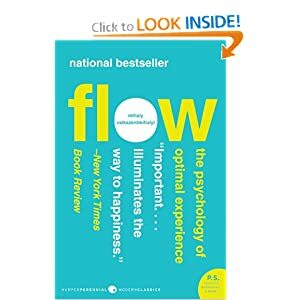 Our summer book is………….. Flow by Mihaly Csikszentmihalyi. Now’s your chance to really savor this classic — WITH company. Each Monday from July 9th through September 17th, one of five coaches will feature a chapter from Flow on her blog. She’ll highlight key points, post discussion questions, and — best of all — develop a custom, complimentary “YOUwork” (aka homework) tool. That’s my favorite part because, honestly, the book is a lot to digest by yourself — much nicer to have savvy companions on an adventure. And if you miss reading a chapter yourself, you can still enjoy the takeaways and use the tools! We hope you will join us and read along. You don’t have to register for anything. Just purchase or checkout the book (from your local library), check back here July 9th, and lend your voice to the discussion. There will be insightful, thought-provoking, and transformative fun. And knowing these fellow coaches — unpredictable awesomeness too! In the meantime — tell me — what other books are on YOUR summer list? And what flavors of ice cream? Do you find certain combinations work best? Flow seems to be working really well with Expresso Explosion [sic], but then again…. what doesn’t? !